After my mini-moan about over-formality at the Together We Can launch, I'm on the look out for good ways of running collaborative events ... and up pops a great example from Proboscis, a creative studio that manages to mix arts, culture and technology in tackling serious community concerns. 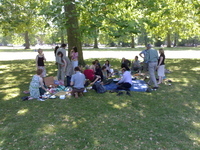 Our aim was to use the informal setting of a picnic and our role as hosts to bring together a diverse group and stimulate conversations, rather than hold a more formal debate or discussion. This placed the emphasis of the dialogue on being a culture of listening rather being about one. 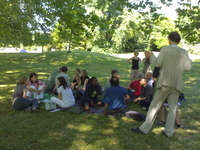 After an hour and a half of introducing people to each other and connecting conversations, the group came together to reflect on what we had heard and said, followed by more conversation and connections over lunch. That's it then. Next time a Government department wishes to show a little flair they can invite us to a picnic. Of course, they can't rely on the sort of weather enjoyed last Saturday. It may just be a matter of shifting the chairs in the atrium, or clearing the conference room and putting down a few cushions. Powerpoint and flip charts should be banned, and instead an artwork commissioned to celebrate the occasion. Proboscis promises one from Camilla Brueton in a few weeks. Count me in. Great! I look forward to participating!